State, county and municipal authorities have the capacity to condemn a building that is not fit for human habitation or use. Whether you are a tenant in a badly maintained, dangerous apartment building or a builder searching for sites to develop, you will use the same search process to determine if a building has been condemned. Condemnation is a matter of public record and is regulated by two kinds of agencies: building departments and health departments. Understanding the condemnation process will help you determine the status of a building. If possible, visit the building you believe has been condemned. If it has been, you should be able to locate a printed notice, usually posted on the front door, which will tell you the date of condemnation, the grounds for condemnation and the government agency issuing the notice. If you are a tenant of the building, you will receive a copy of a condemnation notice by mail. Either notice should have contact information that will allow you to follow up with the agency issuing the notice. In the absence of a notice, visit your local zoning department to obtain an exact description of the building you are investigating. Having the address is not sufficient; buildings are also described in terms of how they are located in an area like a municipality. The zoning department provides Block and Lot information that is used as the legal description of the building for all the records related to it. Consult your local tax department to determine the owner's name and most recent address. Combining this with Block and Lot information gives you the tools to perform a search on local, county and state levels for condemnation notices. Submit this information to your local building department. If there is no record of condemnation at a local level, they can advise you how to contact county and state authorities. Search records of your area health department for condemnation notices, using your legal description. This record will also list tenant complaints and their resolution or failure to resolve. Be prepared to persist in your search. Even with computerized records, data such as condemnation notices can take awhile to be recorded by all the authorities involved. Public notice may be delayed by the inability of government agencies to locate the owner, who must be notified. At each stage of building or health inspection, an owner receives notice of necessary remediation and is given a set time to make repairs before, and even after, a building is condemned. Note all deadlines given to the building owner and schedules for re-inspection. This may require you make several follow-up visits to determine the changing status of the building. Again, be prepared to persist. City of Minneapolis, "What Needs to Be Done to Keep a Property from Being Condemned?" St. Louis MO Housing Comes First, "Condemnations"
MN Attorney General, "Housing; During the Tenancy"
Cornell University Law Library, "Compensation for Taking or Condemnation of Property . . ."
Beal, Janet. 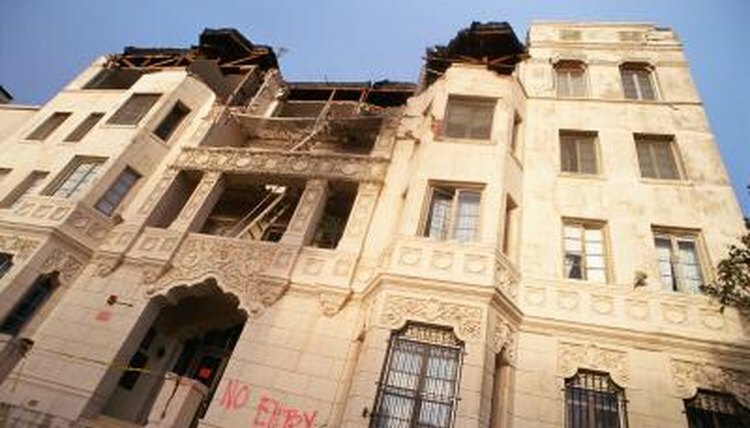 "How to Find Out If a Building Is Condemned." , https://legalbeagle.com/6178204-out-building-condemned.html. Accessed 20 April 2019. Can My Landlord Be in Trouble if He Has No Certification of Occupancy for a Tenant?